Greetings! This is my first time posting, but I have been following (and attempting) the tank for a few weeks. Here is a goofy progress shot. 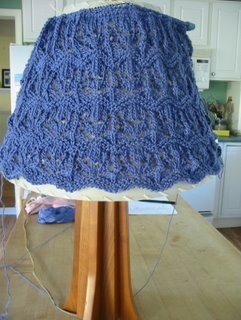 I am thrilled that I am finished with the lace part, but concerned about how loose and open it is. Hopefully blocking will improve the look of the lace and hopefully I won't be swimming in this thing! I am using Elann Summer Sonata that I had in my stash, so it's been an incredibly cheap project. On my first attempt (before I screwed up on the lace) I made the second smallest size, as I have a 36 1/2" chest. But after reading the advice of all of you, the fact that I knit loose, and that I am using cotton, I decided to do the smallest size. Anyway, thanks for all the tips so far, and more on my blog.